With a polar vortex gripping a lot of the U.S. right now, let's warm up a bit with a trip down to Florida. 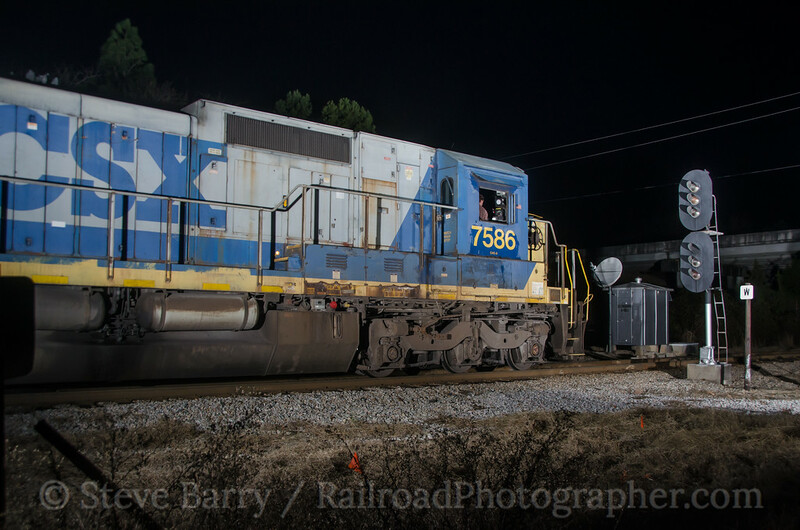 Over the past few weeks we've shown parts of this trip with posts on an evening in Jesup, Ga., street running in Augusta, Ga., chasing the Pickens Railway in South Carolina, and a set of night photos from the trip. 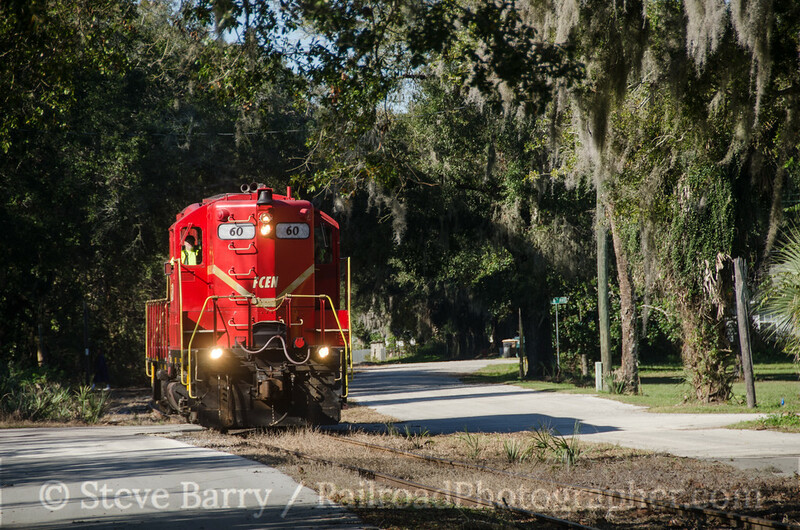 To recap, my brother and I were delivering a car to Florida and spent some time railfanning along the way. Now we're in Florida, and we'll see some of the interesting sites the state has to offer. 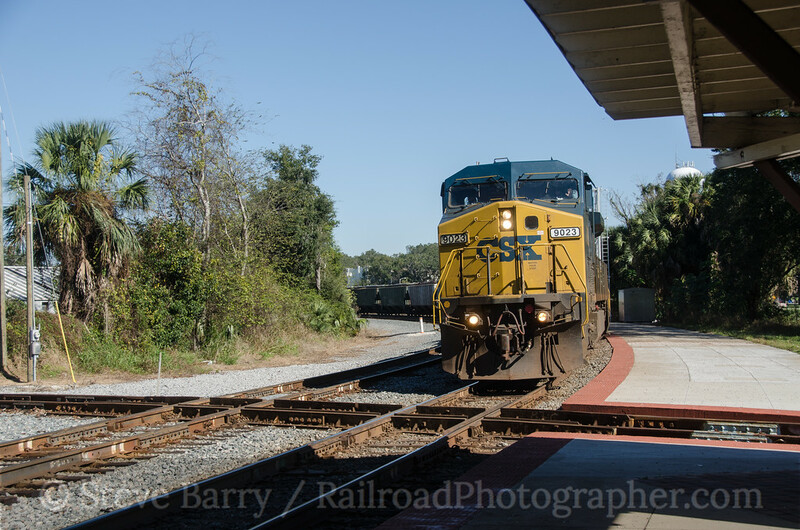 We'll start with the Florida Northern in Ocala on December 16, where GP9 No. 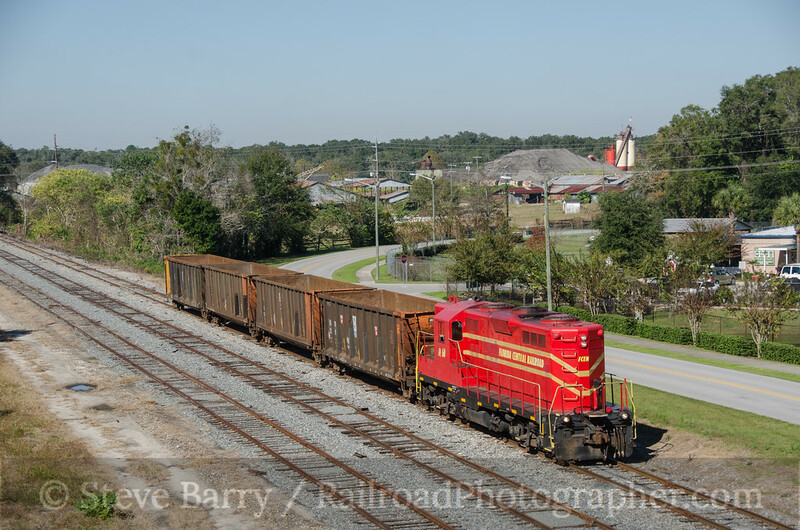 60 from sister railroad Florida Central was returning from delivering cars to an industry on the west side of tow. Spanish moss makes for a nice frame as the train returns to its yard (above). Back at the yard, the crew continued on another branch to pull cars from a scrap dealer. The train made for a nice shot as it entered the yard on the return trip. There was a time when the Florida Central was known for its CF7 fleet. 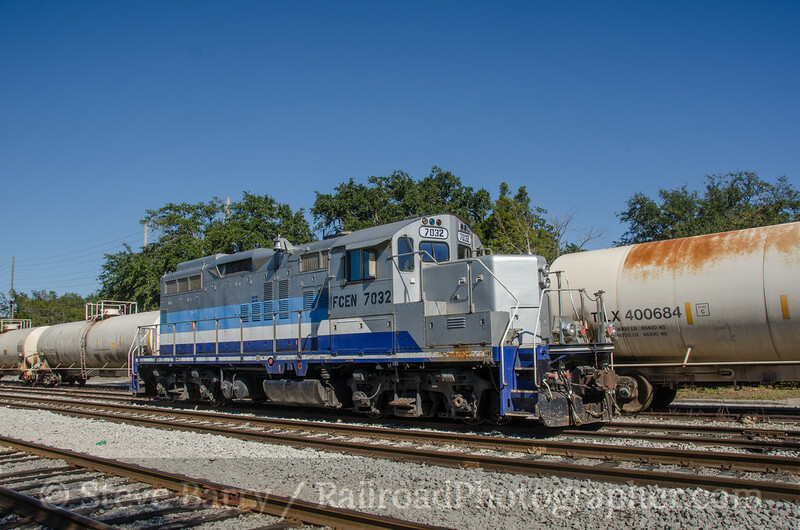 The CF7s were built by the Santa Fe on frames of old F-units; once the Santa Fe was finished with them, they became the de facto short line locomotive of the 1980s as they scattered on the second-hand market. Florida Central's No. 63 still sits in the Ocala yard. with traces of moss and vines showing that it hasn't run in a long, long time. 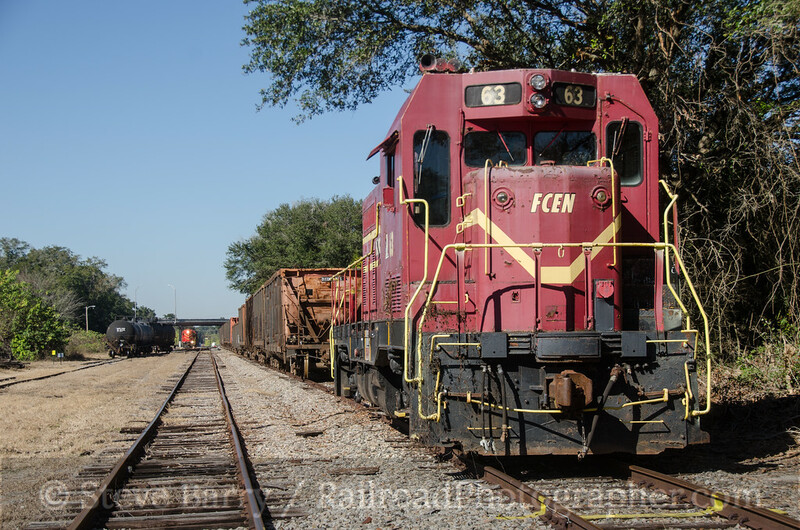 Florida Northern also has a line that heads south, crossing CSX on a diamond at the Ocala passenger station before doing a few blocks of street running. Alas, the railroad did not run this direction on the day we were there, but CSX polished the diamonds with several trains, including this southbound led by C40-9W No. 9023. 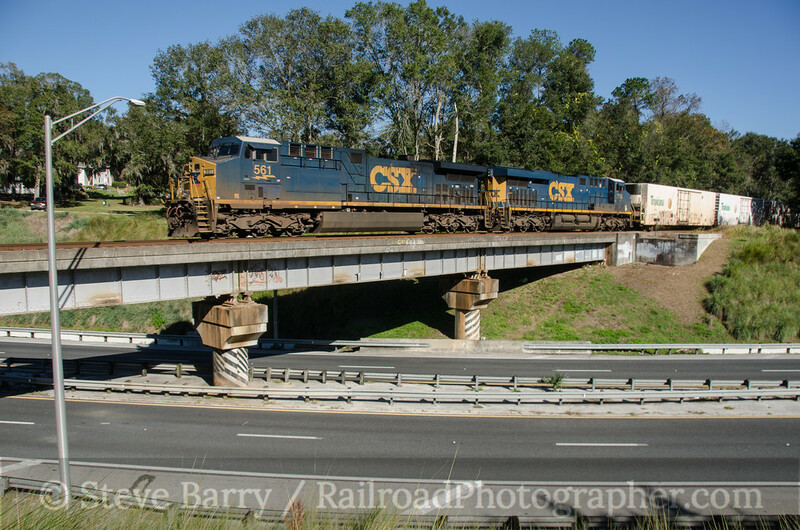 Next up we find a CSX northbound on the south side of Ocala, with AC44CW No. 561 in the lead. Trailing the power is a string of white refrigerator cars carrying Tropicana orange juice to New Jersey. The orange juice is not concentrate -- it's pure as-squeezed orange juice in cartons ready for the store shelves of the northeast. Finishing off our first day in Florida, we scoot a bit east so we're now north of Orlando. 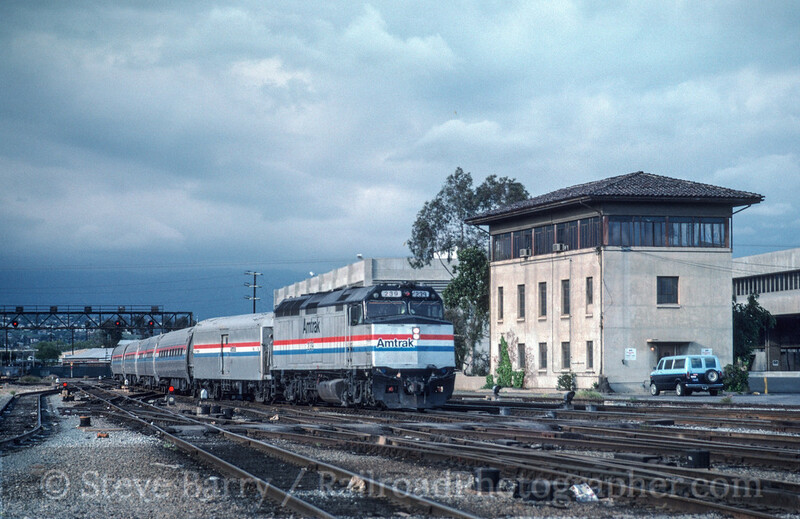 A northbound Amtrak train races past a signal at Eldridge on the former Seaboard Air Line. The defect detector nearby, which broadcasts over the railroad radio, indicted the train had no defects and was moving at 79 m.p.h. The signal is of a design that was unique to the SAL; like many other unique signal systems across various railroads, it will ultimately be replaced by generic signals as Positive Train Control is implemented. 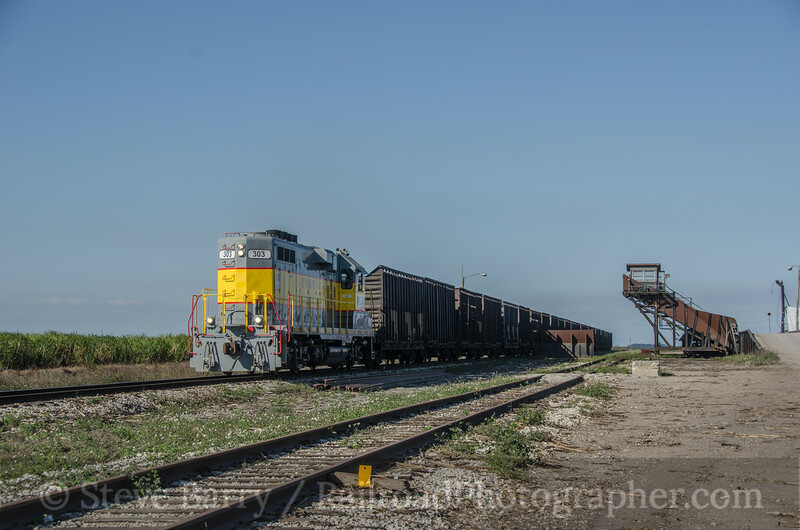 The next day we headed down to the South Central Florida Express, a railroad owned by U.S. Sugar Corp. to serve the cane fields around Clewiston, south of Lake Okeechobee. You might recall we visited this same railroad in February 2013, but a steam line rupture at the mill in Clewiston had all operations shut down. This time the mill was running and cane was being cut. 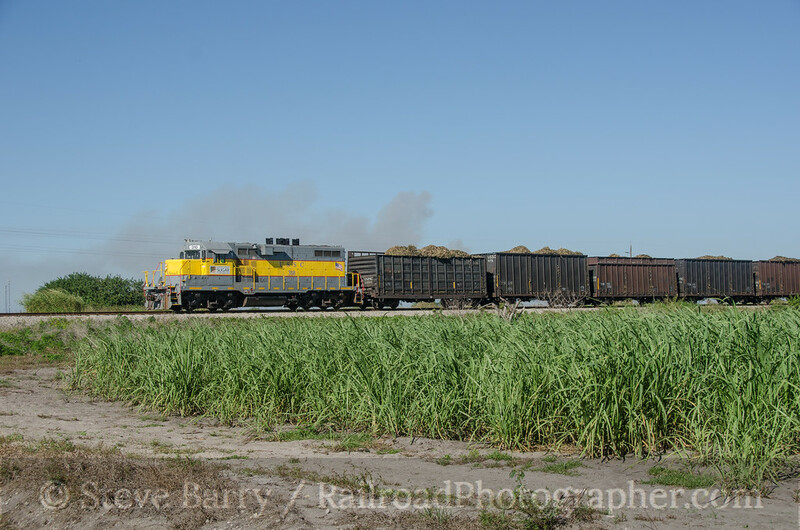 We caught a train of loaded cane cars west of Clewiston as it headed towards the mill. The smoke on the horizon is where cane residue is being burned; you can always find the fields being worked -- and the trains serving the fields -- by looking for smoke. There are dozens of loaders along the railroad, with trucks bringing in cane from the field to be loaded into rail cars. On any given day, different loaders can be in service. GP11 No. 303 lead a string of empty cars southeast of Clewiston past an inactive loader. The cars are adapted from a variety of original cars, mostly boxcars with roofs removed. Sugar cane is highly perishable and needs to be processed within hours of cutting. If an empty train goes out, a loaded train will soon be coming in. Such was the case with No. 303 -- we caught it a little bit later in the afternoon going past another loader as it came back with cane loads. With a flight home the next day, our railfanning would be concentrated within striking distance of the Orlando airport. 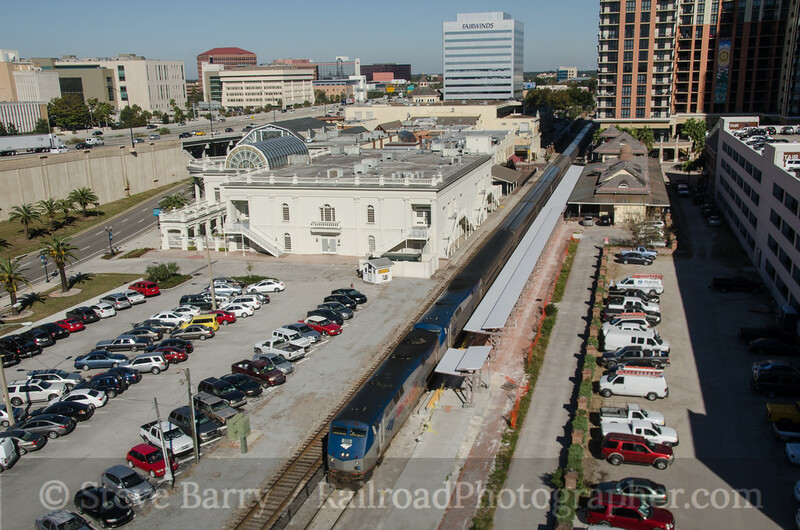 We set up on a parking deck near the old Orlando station on Church Street where we were surprised to catch a SunRail test train running. SunRail is the new commuter service for Orlando scheduled to open later in 2014. The Church Street Station was used by Amtrak, but the passenger carrier has relocated to a new station about a mile south. 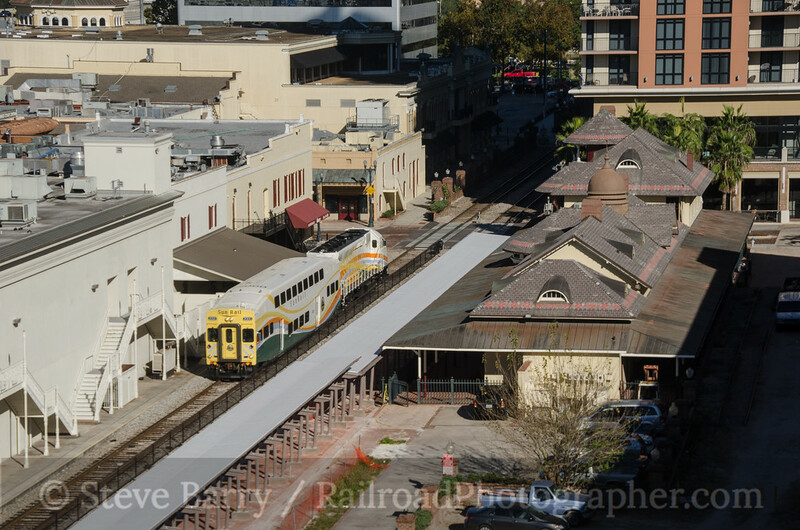 However, Church Street Station is seeing a rebirth as a passenger station; the platform canopies are all new in anticipation of the SunRail service. Not far behind the test train was a southbound Amtrak train, easing its way through the entertainment district that has grown up around Church Street. Once Amtrak was through, it was time to leave downtown and head for the airport. 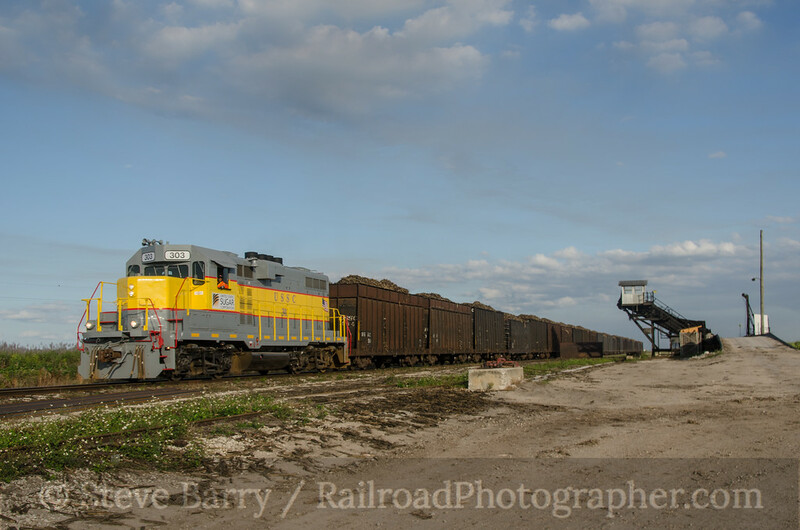 On the way, there was time for a quick stop at the Florida Central's small yard at Silver Star, where GP9RM No. 7032 was sitting. This locomotive started life working for Canadian National and was later transferred to work for the Agence metropolitaine de transport, a Montreal commuter railroad; the locomotive still wears its AMT colors. After this stop, it was off to the airport to catch a flight, bringing an end to the southbound trip to the Sunshine State. A complete photographic gallery of the trip can be found here. 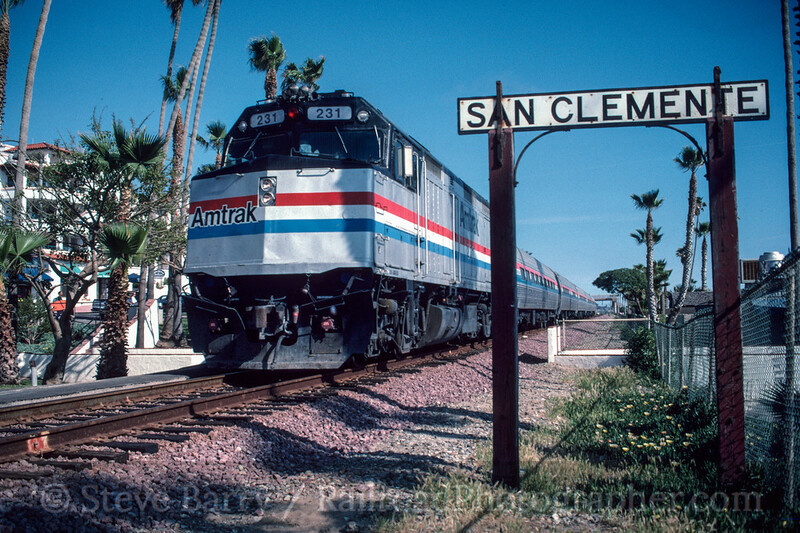 In the last couple of editions of Cool Chromes we have been looking at my first trip ever to railroad heaven -- also known as California -- in April and May 1991. 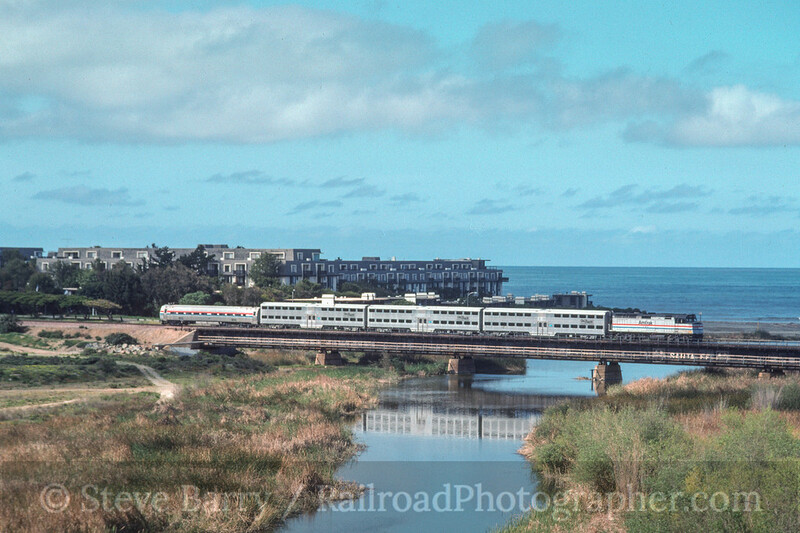 In the first round we looked at some random images from around the Golden State, while in the second round we concentrated on the Santa Fe Railway. The reason I had ventured to California was to visit RailFair at the California State Railroad Museum in Sacramento. 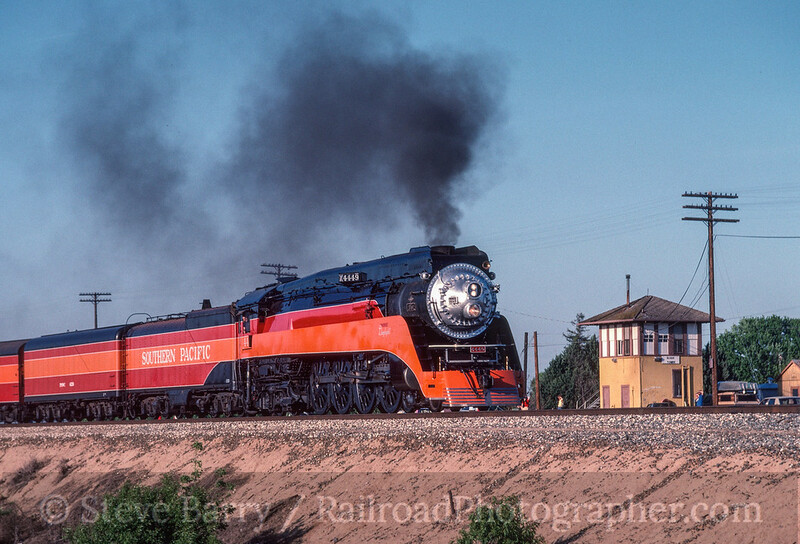 As part of the festivities, a few guest locomotives were being brought in.. One of those locomotives was Southern Pacific "Daylight" 4-8-4 No. 4449. 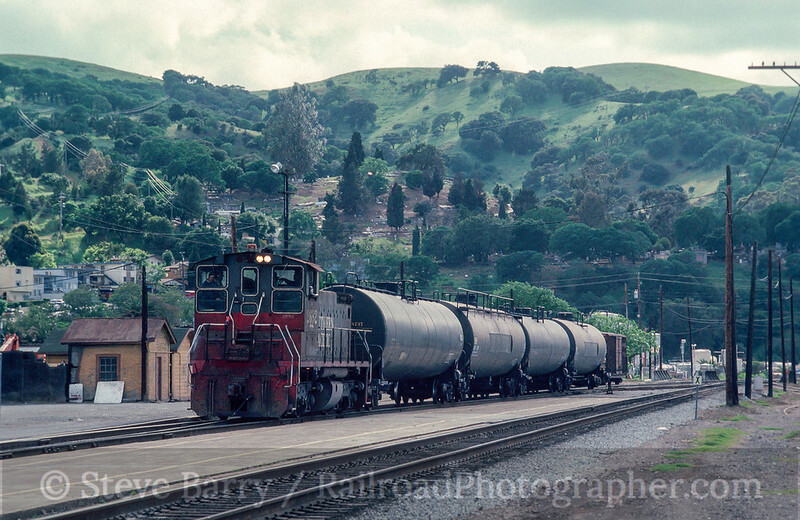 This would be my first encounter with the 4449 and it instantly became one of my all-time favorite locomotives. 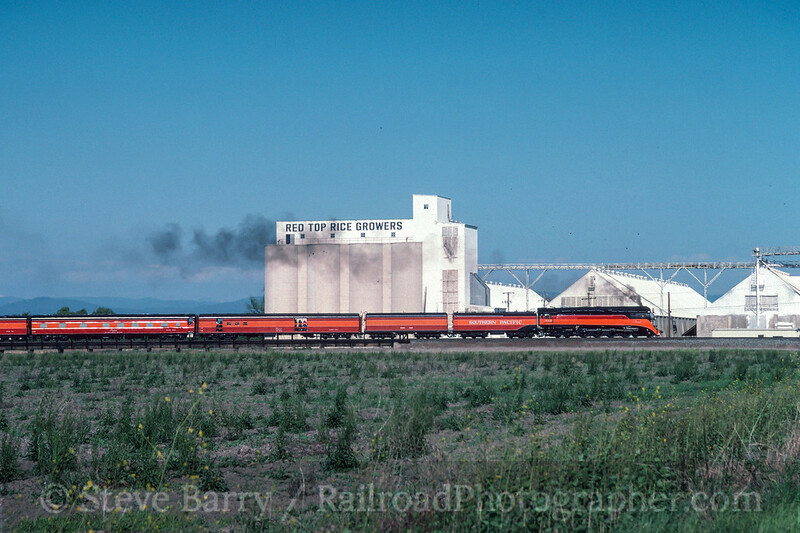 In this post we'll chase the second day of 4449's journey to Sacramento (the first day took it from its home base of Portland, Ore., to Klamath Falls) on April 28, 1991. 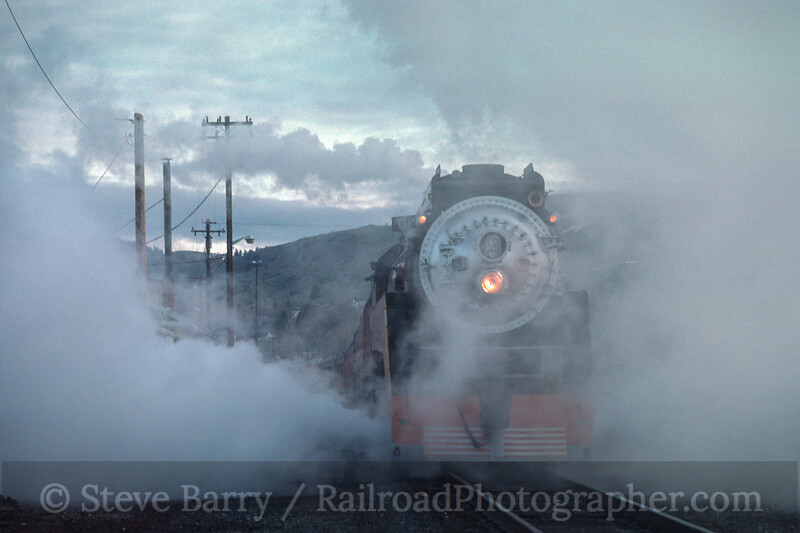 We pick up the train on a misty morning just north of the California border in Klamath Falls, Ore. (above). Next up, we catch the train just as it's departing Klamath Falls. The skies were still cloudy as the train headed southward. 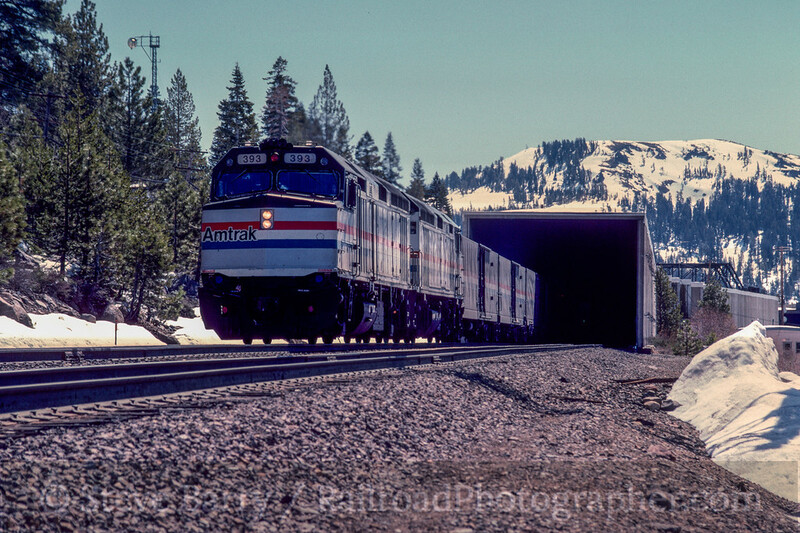 At Black Butte, Calif., the train would get a pair of diesels put on the point to assist with braking down the mountains. 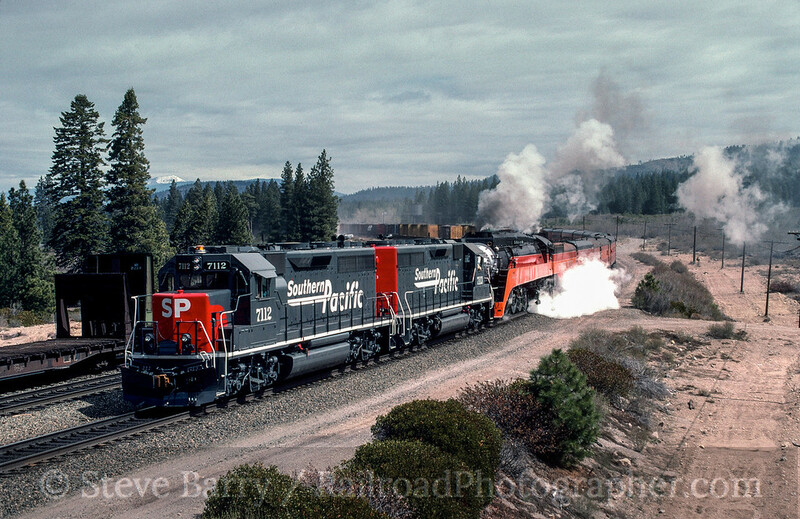 Southern Pacific provided squeaky clean GP40R's 7112 and 7113 to assist the train. We next see the train leaving Black Butte. 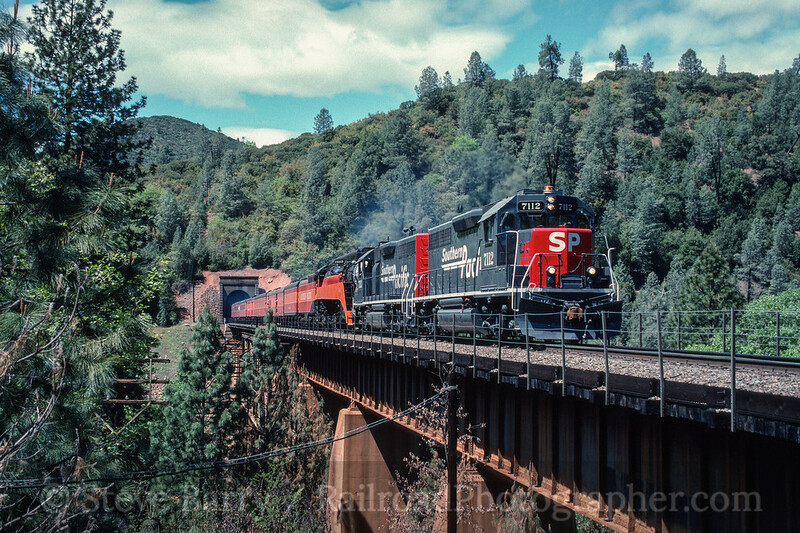 The diesels would be cut off at Lakehead, but just before arriving there the train popped out of a tunnel and onto a massive bridge near the north end of Shasta Lake. Once again running unassisted, the Daylight entered the flatlands, passing the massive elevator at Biggs. 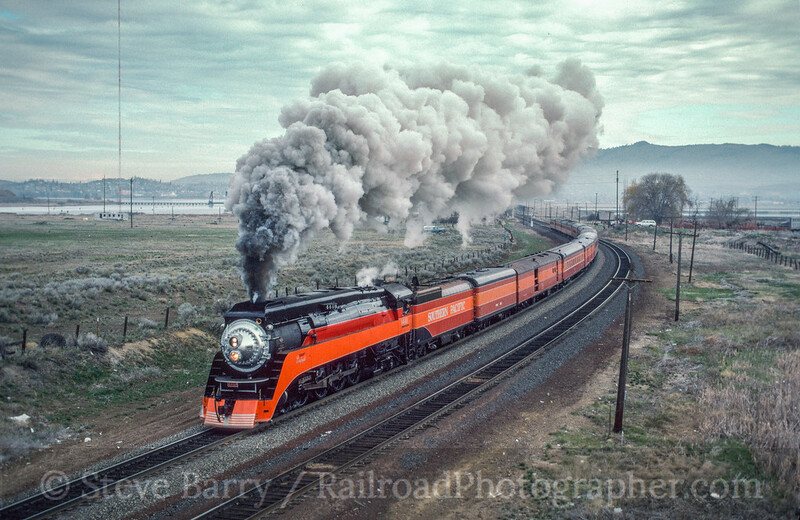 The matched orange and red consist made for one of the most beautiful trains top oprate anywhere in the U.S. in quite some time. Finally on the outskirts of Sacramento, the train crossed the American River and circled past Elvas Tower. Many years later the tower was dismantled and moved for eventual reconstruction (at least partially) at the California State Railroad Museum. When the tower was moved, it was said that "the building has left Elvas." We've spent some of the last few weeks exploring parts of a driving trip to Florida I took with my brother Bruce. This time we'll look at some night activity from along the way. 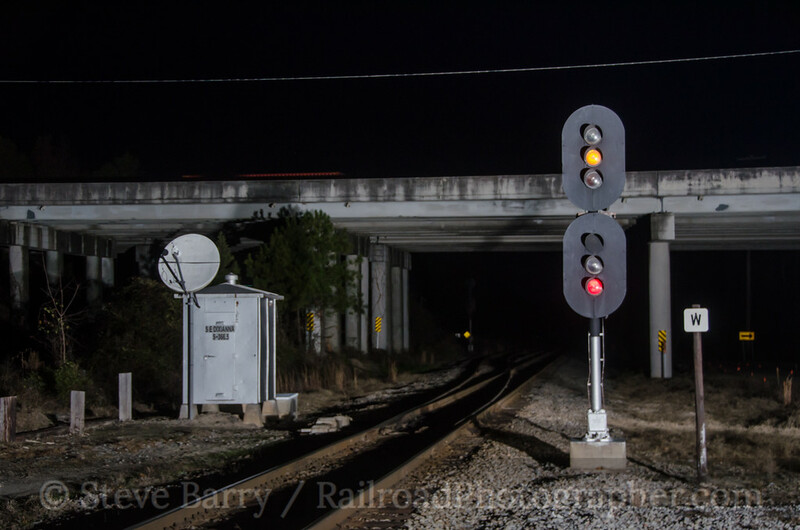 In previous posts we've already looked at night photography in Jesup, Ga., done daytime and night photography on the street running in Augusta, Ga., and spent a day chasing the Pickens Railway in South Carolina. As related in the Pickens post, once we were finished there on December 13, 2013, we headed over to the scrap steel mill at Cayce, S.C. After finishing there, we went out seeking a night photo opportunity. 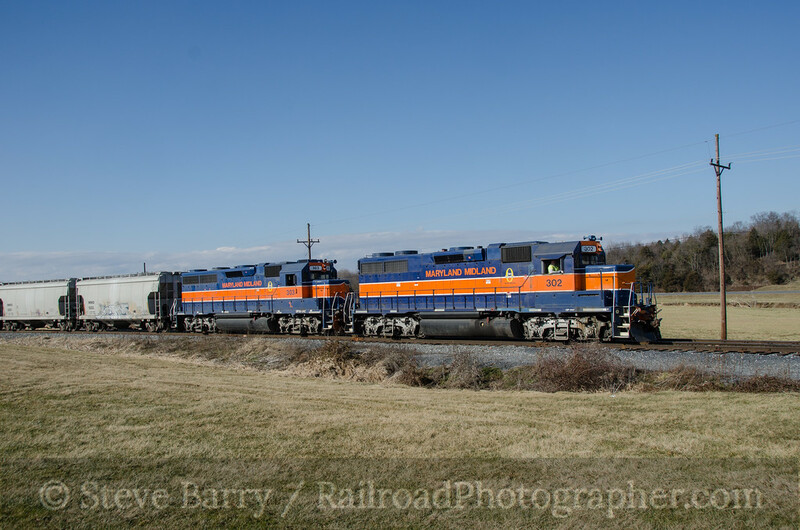 That chance came when we found a CSX train working an automobile sorting center south of town. The train was inaccessible, but we could see it working to our south. We set up just north of the sorting center, where we found a railroad signal that was distinctly Seaboard Air Line -- a predecessor of CSX. 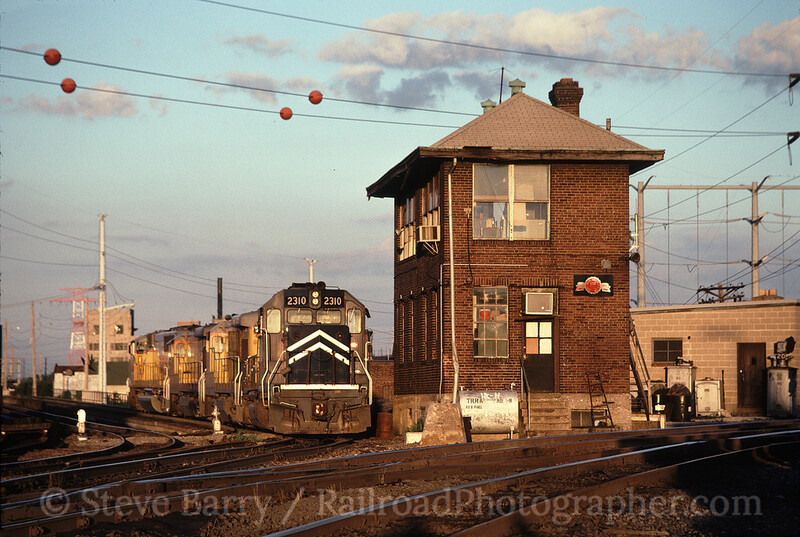 Many railroads of the mid-20th century had their own distinctive styles of signals that varied from one road to another; today many of these unique sentinels are being replaced by standardized signals as railroads install Positive Train Control along their lines. Thus, a chance to shoot a train past a signal of the past was a good opportunity. After a long wait, the train finally pulled far enough north that we were able to get CSX C40-8 No. 7586 passing the signal. 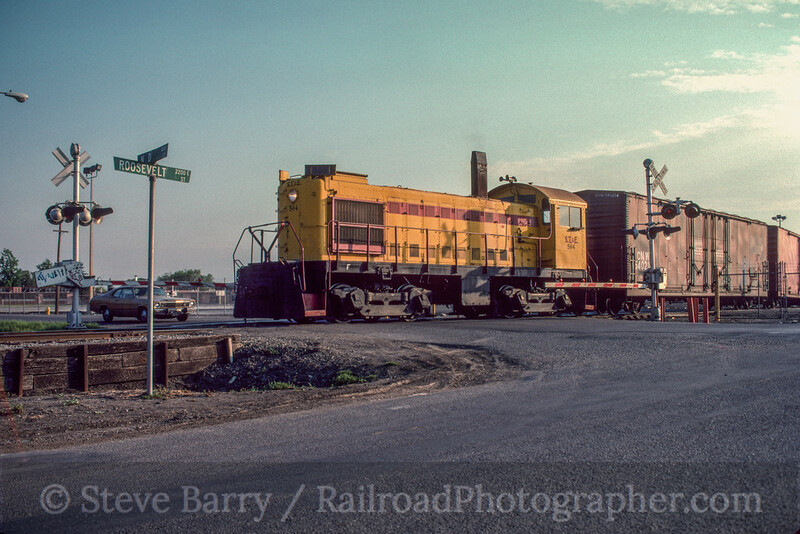 During the day we had stopped at the Greenville & Western in Belton, S.C., where we found they had borrowed a GP30 from sister road the Aiken Railroad. 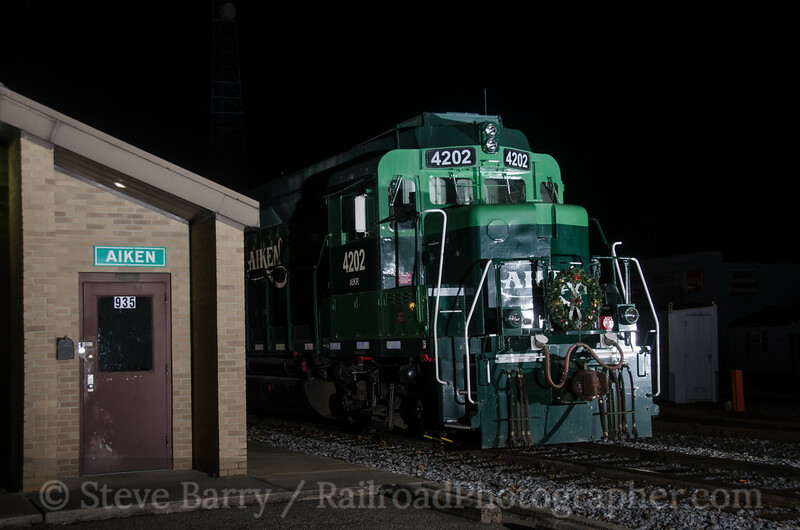 An employee in Belton said it was one of two GP30s owned by the Aiken, and the other was in the railroad's namesake town. We had left Cayce and were heading for Augusta, Ga., when we saw a sign on the interstate saying that Aiken was off the next exit. How hard could it be to find a GP30 in town? Google satellite images of the town showed an obvious spot where motive power might be kept, so we headed there and -- voila! 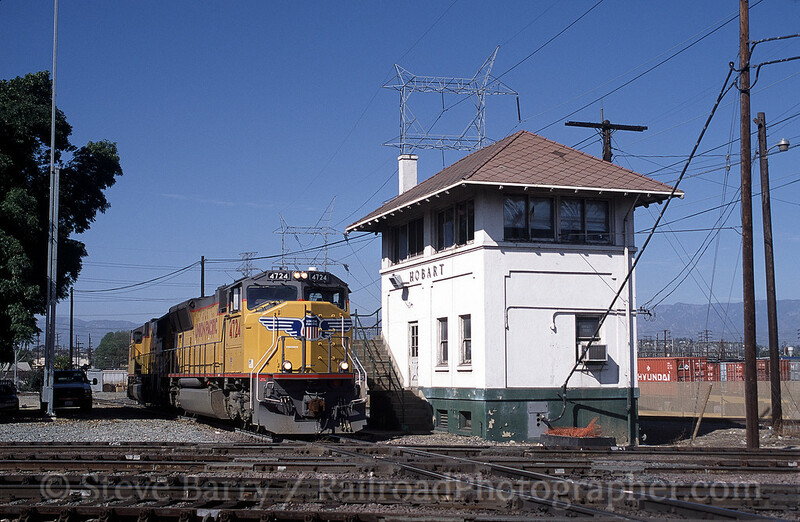 -- there was the GP30, along with LTEX SW1500 No. 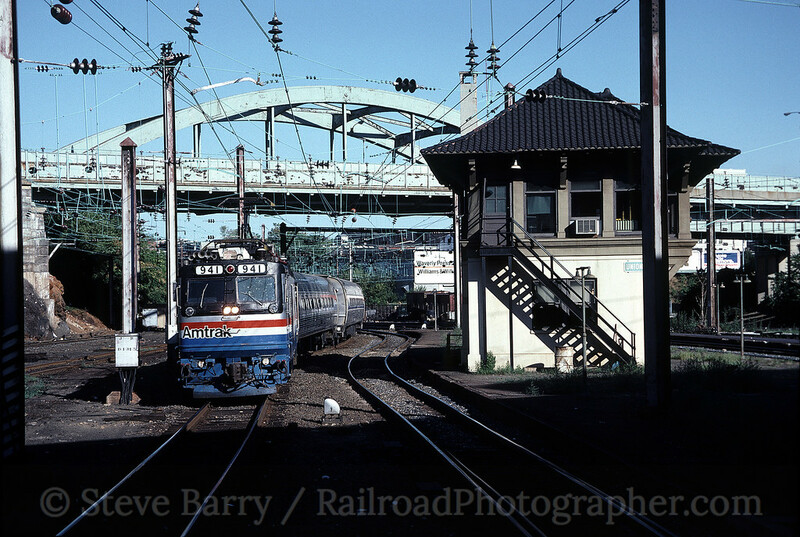 1543, a leased locomotive from Larry's Truck & Electric. 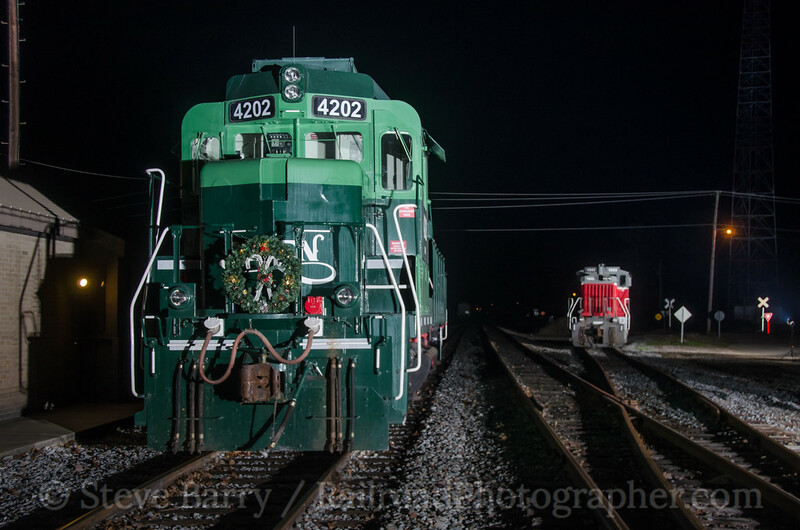 We broke out the lights and duly captured both locomotives (below and top photo of this post). The following two nights we've already discussed in previous posts (in the Georgia towns of Augusta and Jesup). Finally we made it to Florida on December 16! 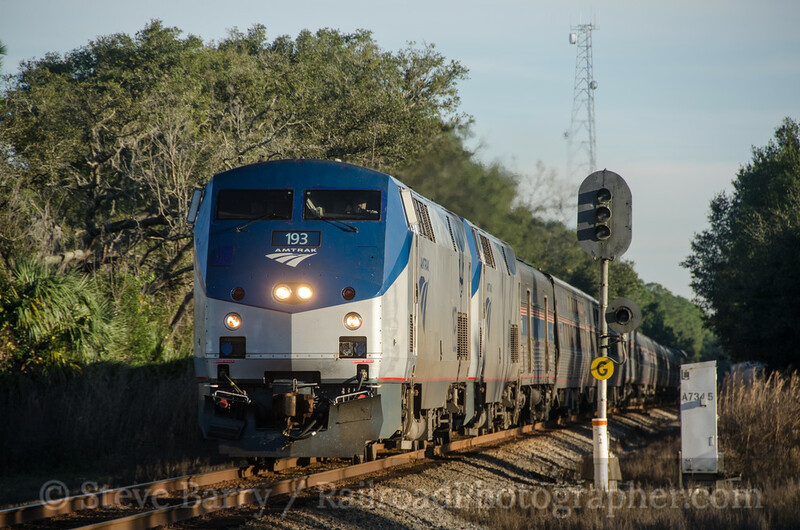 After a day of shooting in the Ocala area, we knew a train was coming down the former Seaboard Air Line and would pass the Amtrak station at DeLand. 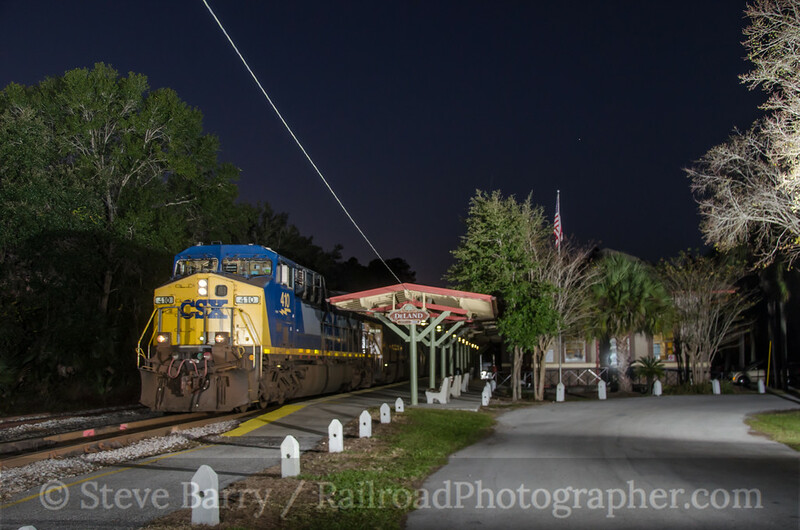 Just after sunset, we were able to get the southbound train with CSX AC4400CW No. 410 leading. Our last full day in Florida was spent on the South Central Florida Express, the last sugar cane railroad in the United States, operated by U.S. Sugar in Clewiston, Fla. Our next (and last) post on this trip will be next week where we'll look at some Florida railroading, but in keeping with our night photo theme we'll finish with the last shot we got of SCFE on December 17. 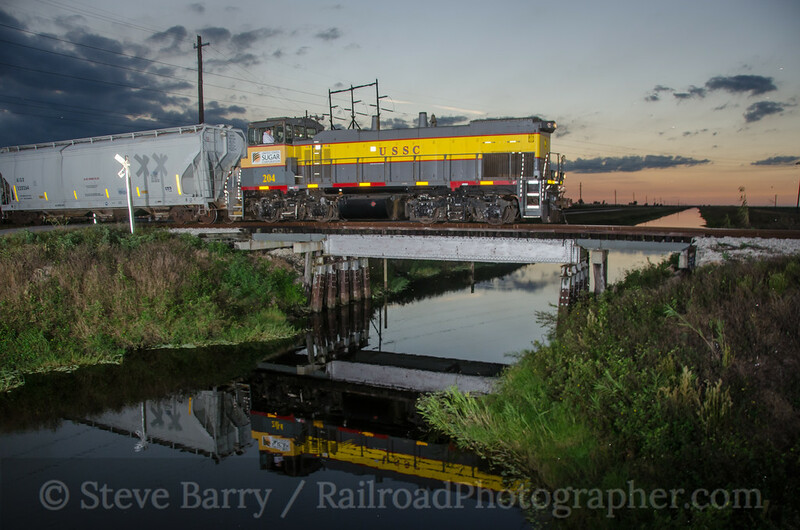 After a day of shooting we knew a switcher was coming back into Clewiston and it would get in just after sunset. We set up along a bridge over the canal (the adjacent road bridge was gated at the far end, giving us a convenient place to park and set up our flashes). Like clockwork, the local appeared just after the sun set but before darkness settled in, letting us get a twilight shot as the orange sky reflected off the canal. 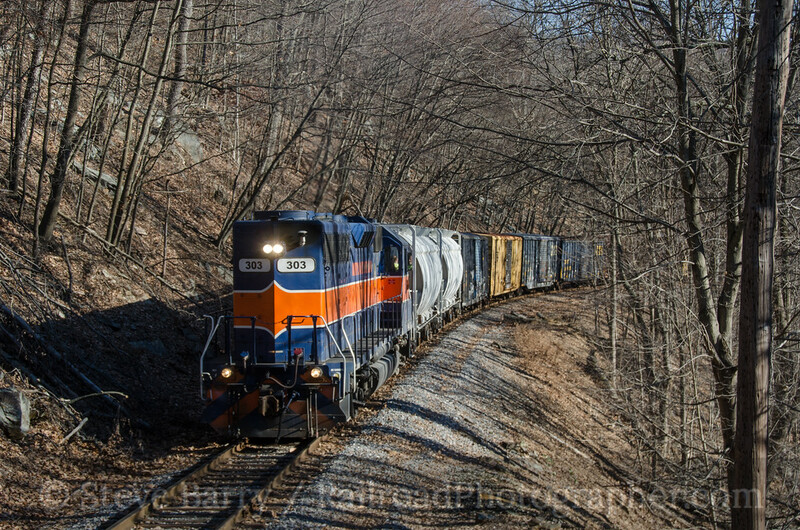 The strobes provided just the right amount of fill flash to make the train "pop." It was a unique shot to finish off our night photography for the trip. All the photos taken this day can be found in Photo Lines here. 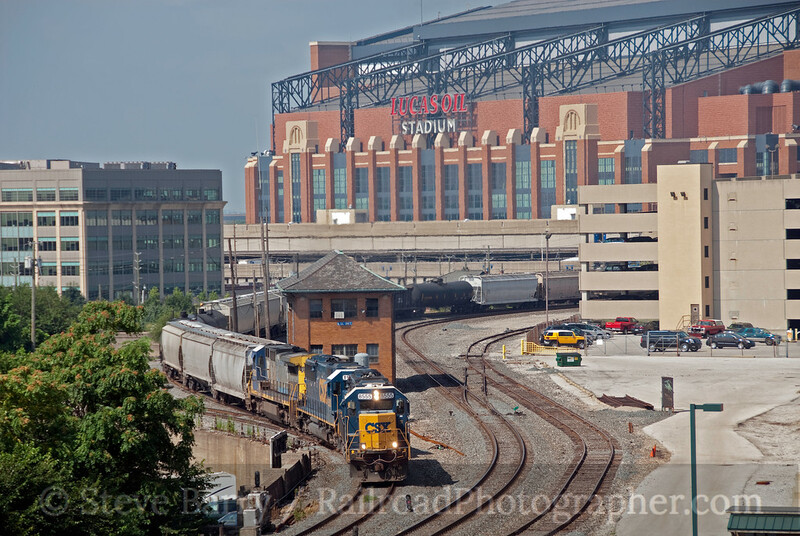 Short line railroading is in a constant state of change. With corporations gobbling up profitable short lines, locomotives get shuffled around and paint schemes get standardized. 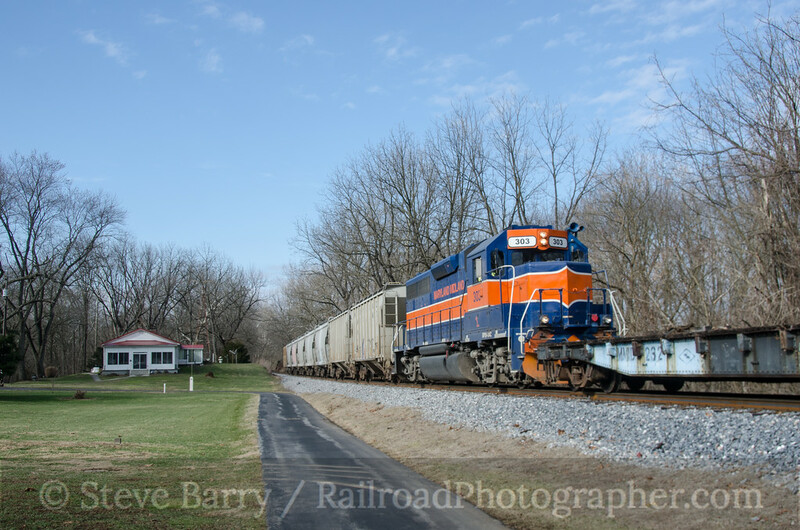 The Maryland Midland is a railroad about to undergo change -- located in Union Bridge, Md., the MMID has been owned by Genesee & Wyoming since 2007, and its locomotives will soon lose their blue and orange paint, replaced by G&W's orange and black. On January 17 I headed down to the Maryland Midland with brother Bruce Barry, and we met up with Bill Kalkman there. Rumors of new paint were in the air, and we wanted to get one last hurrah of the blue and orange. The railroad is shaped like a giant cross, with the east-west lines much longer than the north-south. The eastern end of the cross goes to Emory Grove, served on Tuesdays and Thursdays. while the west end goes to the CSX interchange at Highfield, served Mondays, Wednesdays and Fridays. The east-west line is the former Western Maryland main line, and the MMID began operations on this route in segments starting in 1983. The south line goes to a stone quarry, while the north line serves a single industry, and both of those see trains when the mood strikes. 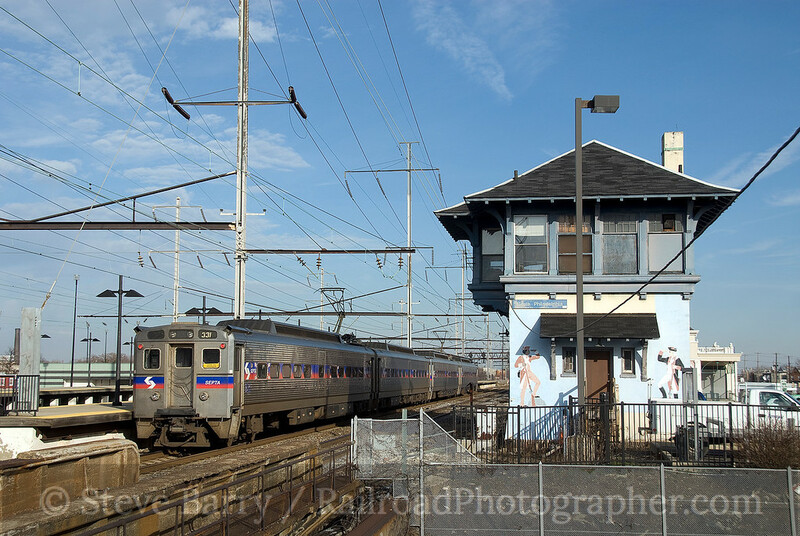 The north-south line is the original Maryland Midland, a former Pennsylvania Railroad branch that the MMID began operating in 1980. Indications were we'd get a train to Highfield, the most spectacular part of the line, on this Friday. The Highfield line is the former Western Maryland main line, and makes a spectacular climb from Thurmont to Blue Ridge Summit, Penn. The train usually runs 20-30 cars or more, with four locomotives often leading. Anxiously we set up for a shot just west of the headquarters town of Union Bridge, waiting on the show. 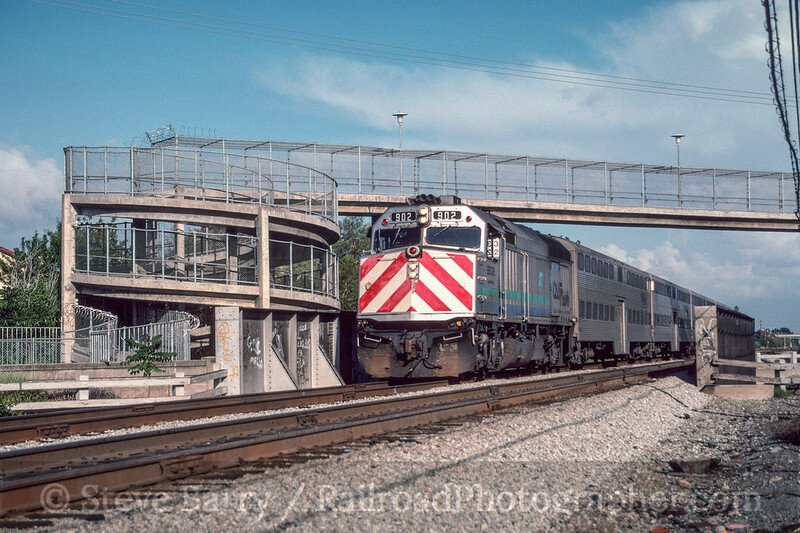 Imagine our surprise, however, when the train trundled by with a single unit, GP38-3 No. 303, and only three cars. To add insult to injury, the locomotive was backwards. Undaunted, the chase was on. The train did not pause at Keymar (where the two lines of the cross connect), heading on towards Thurmont. We got another across the field shot near Rocky Ridge, then waited -- a long time -- in Thurmont. When the train arrived, we found that it had picked up a boxcar from a brickyard, and was pushing that boxcar in front of the engine. 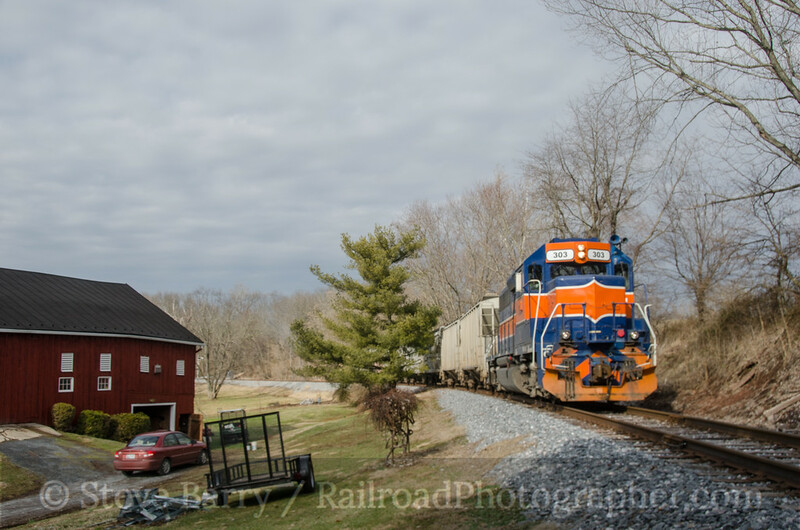 At Thurmont they shoved the boxcar into an industrial siding, ran to the other end of the siding and pulled out a long cut of cars, put the train together and headed up the steep grade towards Blue Ridge Summit. We set up on the grade for a shot (below). It would have looked (and sounded) a whole lot better if it had been a more typical big train with multiple locomotives. At Sabillasville the tracks make a huge horseshoe around the town (it's actually a part of a large "S" as the tracks swing back again up in the mountain above town). 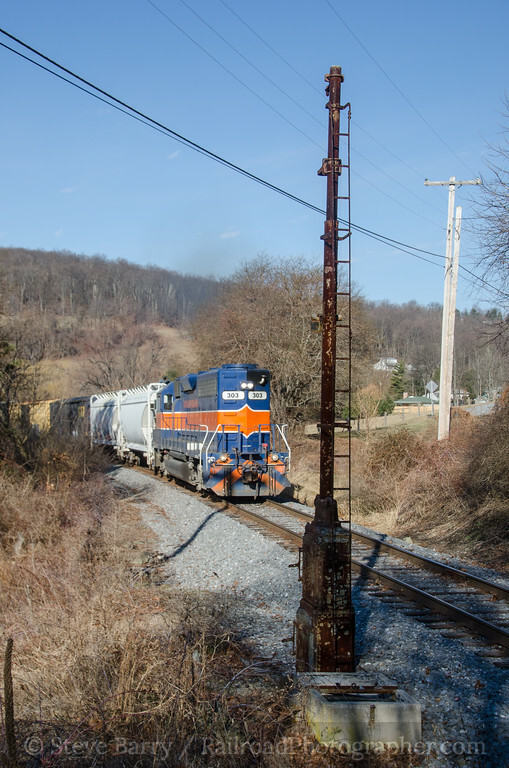 We set up for a shot of the train passing a mast where a Western Maryland signal was once mounted. There are several remnants of the WM along the line, including a couple of signals with the heads still in place. 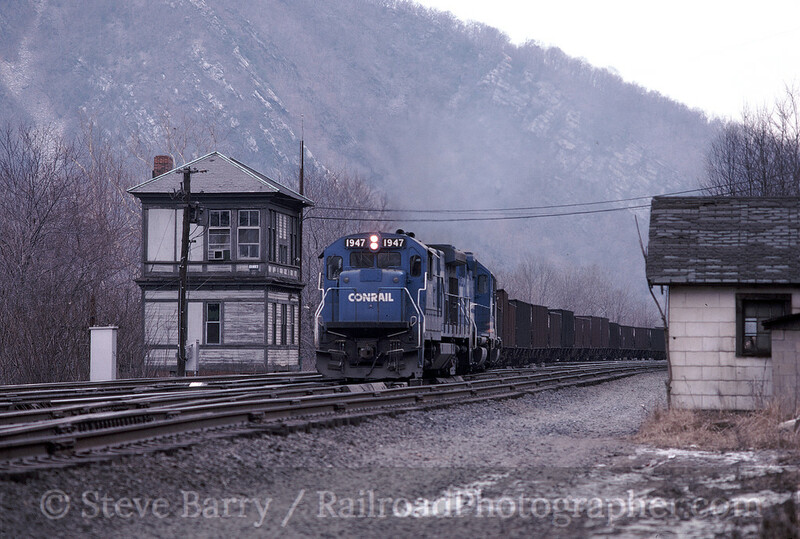 After circling Sabillasville, the railroad briefly pops into Pennsylvania at the top of the grade at Blue Ridge Summit. The station is still here, now serving as the town library. 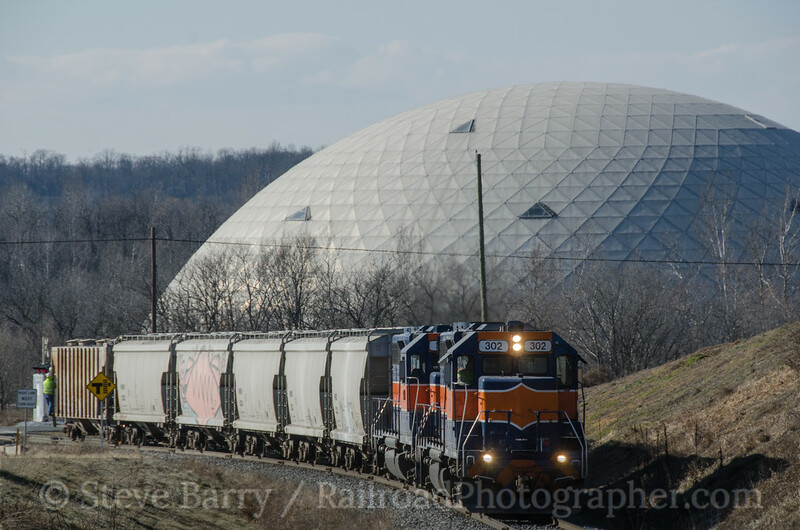 As soon as the train crests the summit it heads back into the adjacent town of Highfield, Md., where the MMID connects to CSX's ex-Western Maryland line that comes down from Gettysburg. 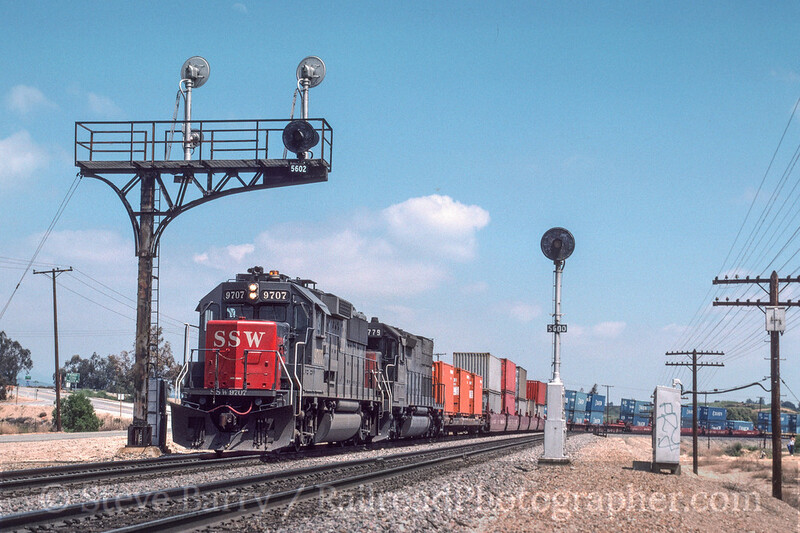 It is not uncommon for CSX to be in Highfield at the same time as MMID. This was not the case on this day. 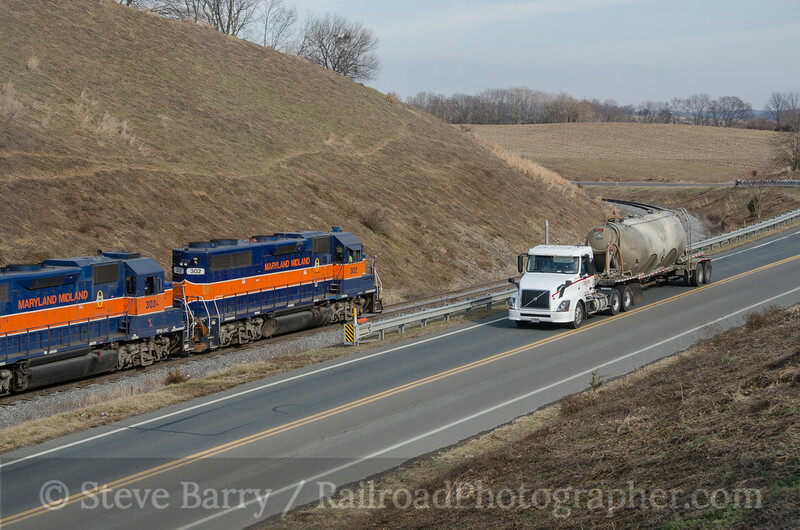 After dropping the cut of cars that had come from Union Bridge and Thurmont, the lone locomotive picked up a string of covered hoppers destined for the cement plant back at Union Bridge. We were about to get rewarded for our chase of a backwards locomotive -- we would now have the locomotive facing the right way with good light on the nose for the chase back to Union Bridge. Except we didn't. High clouds moved into Highfield just as the train was ready to head back down the hill. 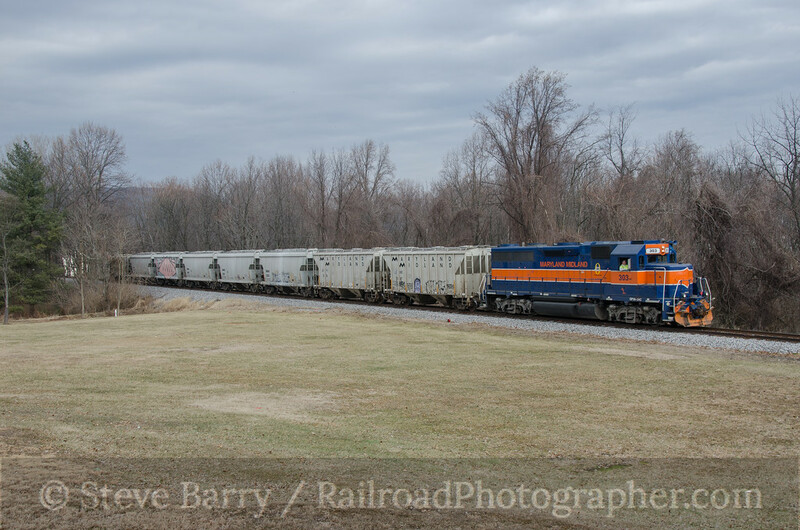 We set up on the horseshoe curve at Sabillasville for a shot that wasn't bad, but would have been a whole lot better in sun. Outside of Sabillasville we got another nice shot that would have been well-lit if the sun had been out. The clouds were beginning to thin out already, but luck wasn't quite on our side. 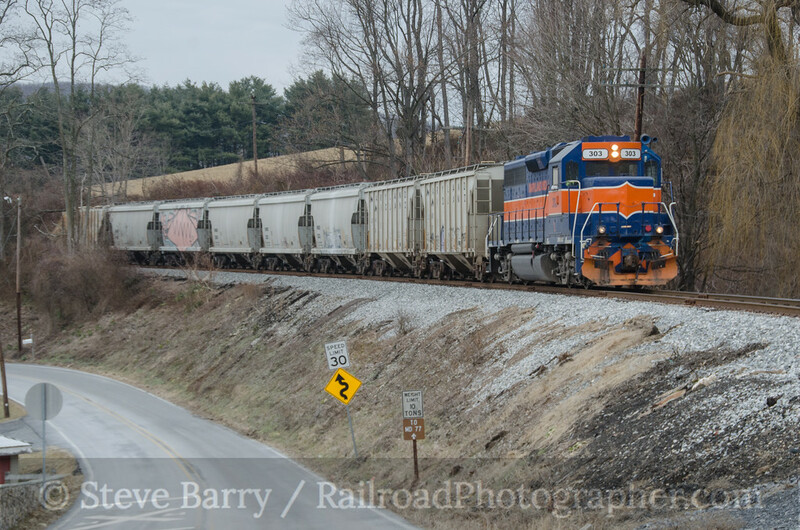 Finally, as the train arrived in Thurmont, the clouds thinned enough to put some light on the train. We shot it from a hillside adjacent to the cemetery on the west side of town. Okay, I should still be able to get a handful of decent shots. The sky was much improved, and we buzzed through Keymar and set up for a shot outside Union Bridge. The train took an unusually long time to get to us. The good news was the sun was out. The bad news was the train stopped at Keymar and picked up a flatcar, which it was now pushing ahead of the locomotive. Back at Union Bridge our only hope was that the train would run to the large Lehigh Cement plant south of town. 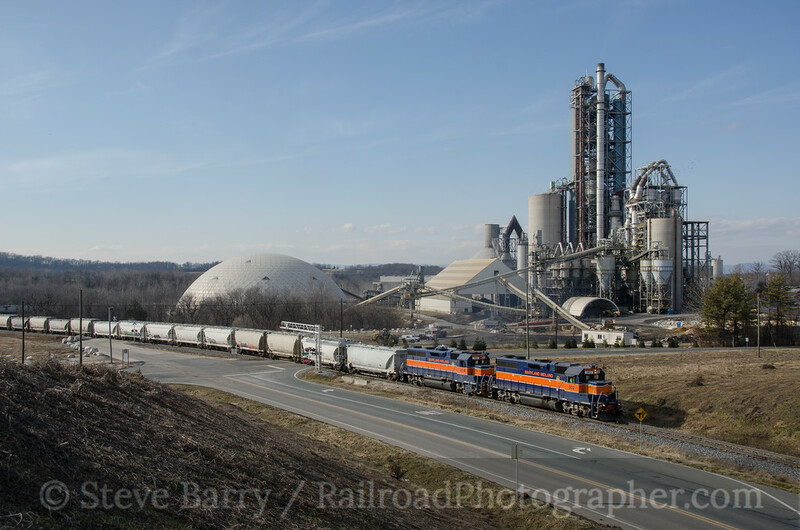 We headed to the wye where the interchange to the cement plant was located -- Bill had a set of screwdrivers with him and we were able to repair my camera -- and after about 90 minutes we were rewarded with the train coming with a cut of covered hoppers. A second locomotive was added to the consist for the run up the hill (below and the top photo of this post). The train would push back into the plant, where it vanished for about a half hour. That's pretty typical for a run up to the plant. 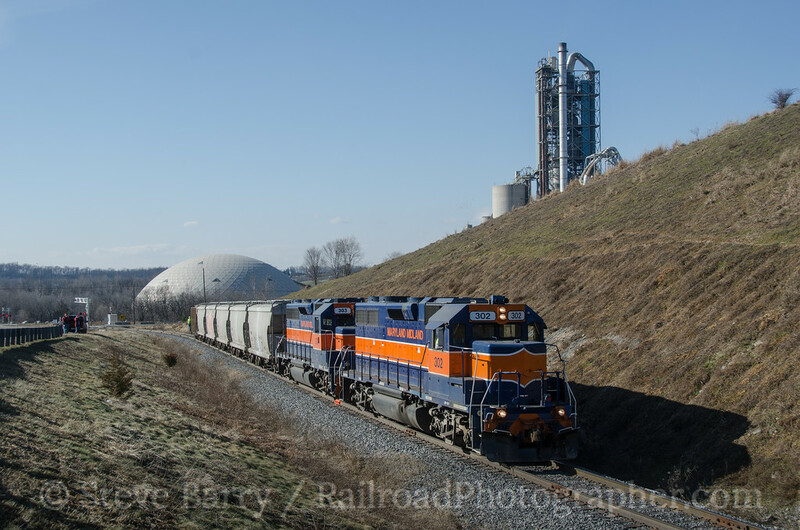 Finally the train came out and we were able to get the "money shot" from the adjacent hillside as it went past the plant. 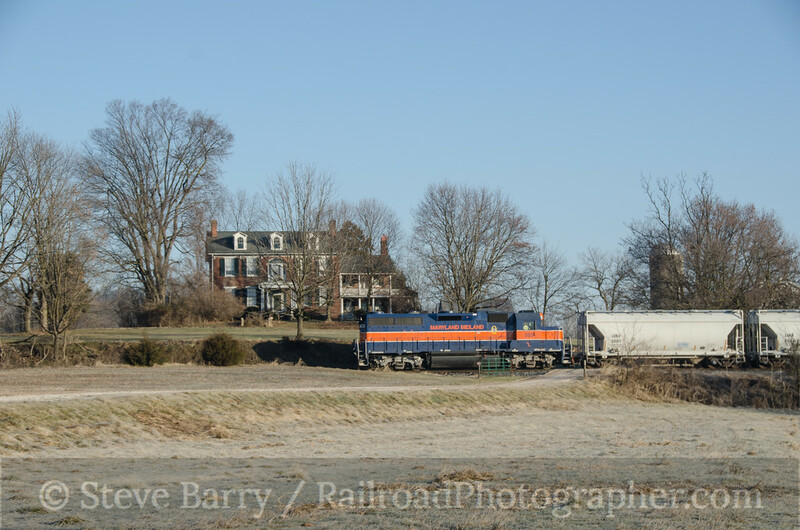 The train headed down the hill and pushed back into the yard at Union Bridge. We asked the conductor if there was anything else going on that day, and he said this was it. Bruce and I said goodbye to Bill and we headed for Norfolk Southern in Pennsylvania. It was a challenging day on the Maryland Midland, and hopefully we'll get back one more time before Genesee & Wyoming's paint brushes get to the power.